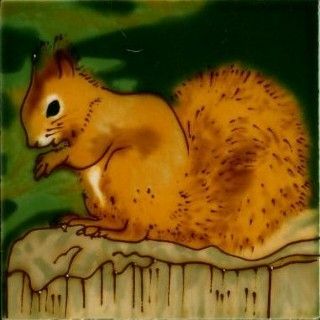 A hand painted ceramic coaster tile with a really colourful and detailed painting of a Red Squirrel. The Red Squirrel is native to Britain and is widely seen across the Highlands of Scotland although quite rare further south. Its future is increasingly uncertain as the introduced American grey squirrel expands its range across Britain. This item can be Gift Wrapped, complete with Gift Tag to include a personalised message. Please selectGIFT WRAP from main menu.